Babolat Pure Aero Tennis Backpack 753074. Material &###xA0;: Polyester 60%, PU 20%, TPE 20%. Dimension&###xA0; : 32 cm (W) x 45 cm (H) x 24 cm (D) / 12.6" x 17.7" x 9.4 inches. We do not accept P. BOXES -PLEASE PROVIDE A PHYSICAL ADDRESS&###x200B;&###x200B;&###x200B;&###x200B;&###x200B;&###x200B;&##x200B. We advise you to use a reputable carrier service when returning your goods. We guarantee that your issue will be solved quickly. We usually respond within 24 hours on weekdays. Thank you for visiting our. Main Features ---Brand : Babolat ---Gender : Unisex ---Material : Polyester 60%, PU 20%, TPE 20% ---MPN : 753074 ---Color : Black/Yellow ---Dimension : 32 cm (W) x 45 cm (H) x 24 cm (D) / 12.6" x 17.7" x 9.4 inches. 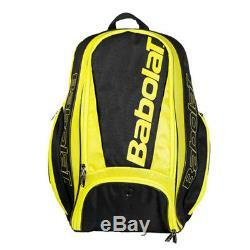 The item "Babolat Pure Aero Tennis Backpack Bag Black Yellow Racquet Badminton NWT 753074" is in sale since Friday, January 11, 2019. This item is in the category "Sporting Goods\Tennis & Racquet Sports\Tennis\Bags".joy" and is located in Seoul.